With our varied topography in San Diego, a great majority of my clients have some element of a grade change on their property. Many of our communities are built on hillsides with terraced lots; one neighbor higher than the next. And very common is the backyard slope if you own property against a large hillside. But in this instance, I’d like to share landscape ideas for a sloped front yard. Very often when homes are built the developer will provide a much engineered, utilitarian sidewalk, 36” wide perpendicular off the driveway to the front stoop and entry. All of this is to obtain permits for occupancy. It may be years later or a few months after a new home is constructed that a client will ask to add a proper entry walk from the sidewalk leading to the front door. This way, guests do not have to amble up the driveway, next to a parked car to find the front door. And of course this all becomes a new issue when a slope is involved. As per the featured image above, this client had exactly this scenario. 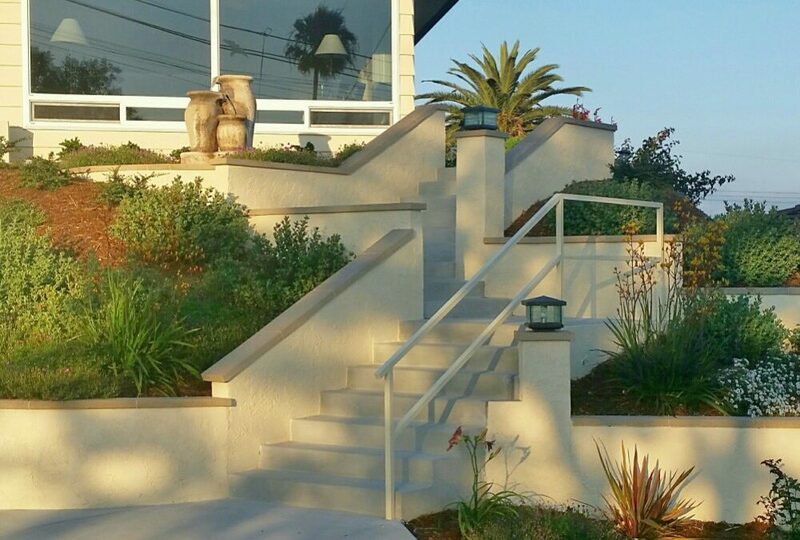 Originally an unsightly straight run of steps from top to bottom, these homeowners wanted a more welcoming, aesthetic approach to invite guests to their home. Beyond the steps were extra retaining walls and a variety of plants of which I will discuss later…. In lieu of traditional retaining walls, another client wanted to add larger boulders as per the second photos. Note the use of a crane to place these large pieces. This is a much more natural effect and can be a suitable solution for a more rustic setting. 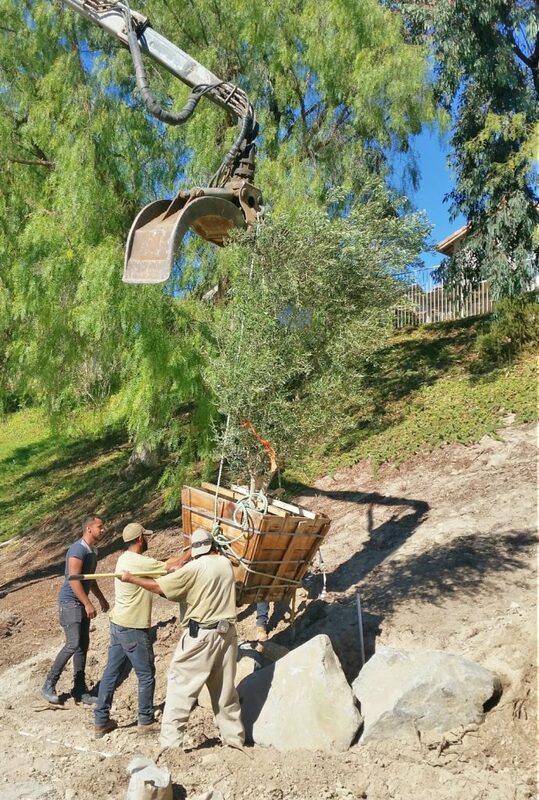 These boulders do help retain the hillside behind and also create a level planting spot for a new olive tree to grace the lower section of the slope. However all slopes have one thing in common, which is of course gravity. And with gravity becomes the issue of water, both in the form of retention and erosion. With or without walls or boulders, landscape ideas for a sloped front yard are typically related to the types of plant materials that will successfully grow on the slope. These are plants that should not require a great deal of water (there’s that gravity issue again), grow in a prostrate manner as more of a groundcover and don’t require any maintenance. It’s not an easy feet to place tall shrubs on a slope and expect to prune them in to giant topiaries. You cannot balance a ladder on a slope anyway. There are also many California Native Plants to use by visiting Las Pilitas Nursery. Sure, you’ve seen our freeway embankments covered with the spectacular ice plants with neon colors in the spring. These plants work too, but they need overhead spray irrigation. The plants listed above would do great on drip irrigation on the slope and it would conserve water as well. One of the last key ingredients to mention for landscape ideas for a sloped front yard is the top dressing of bark mulch. One of the best types of mulch to use on a hillside is shredded redwood mulch often referred to “gorilla hair” mulch to to its fibrous texture. The real benefit to this mulch is that it is very long lasting (redwood does not break down easily) and the texture allows it to stay on the slope, whereas many other mulches will slump or slide off. To have an expert assessment of your front yard slope, or any other part of your outdoor spaces contact Letz Design to get more specific ideas.